Let’s take a closer look at the front entry door and decking. We assessed the condition of the finish and decided to propose a twin chemical power washing strip using Lovitt’s Cleaner & Brightener chemicals. We only recommend blasting techniques as a last resort on log homes, as it is a more costly process and requires much more preparation on the logs following the blasting as compared to the power washing technique. Each log home has its own situation and the method of removal needs to be determined by an experienced estimator. Call us now to help you determine your situation, as always, our estimates are free! Here’s a look at the backside of the Hayes log home, it faces a large orchard with views of the Wenatchee National Forest. Here’s how the entry of the log home looks now after restoration and 2 coats of Lovitt’s Natural Gold oil based wood finish! 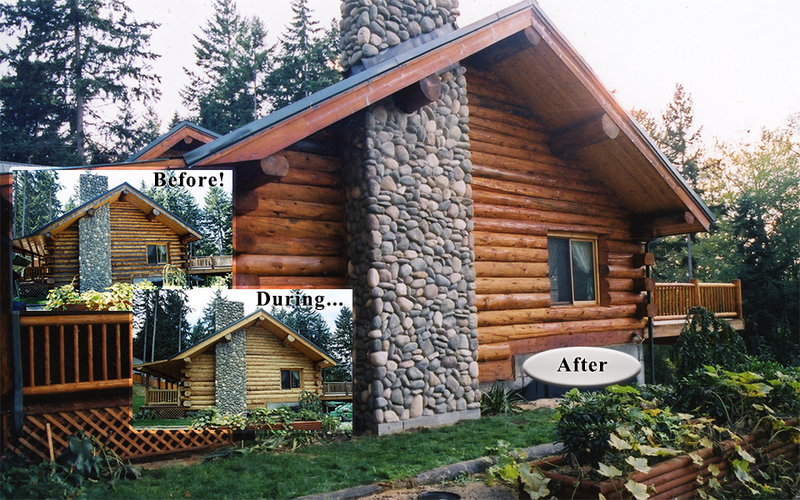 If you want your log home restored and protected, call us now for a free estimate! The log home is protected from the weather, looks great, and is on a system of long term maintenance that is guaranteed to keep this home protected and in great shape from here on out! The backside of the log home is now looking better than ever, but best of all, it will be protected from the snow, the driving rains and the relentless UV damage caused by the weather. Here is a close up of the back deck boards, notice how the Lovitt’s Natural Gold oil based wood finish really brings out the natural beauty of the wood. No other professional finish can match the look, quality, and last of Lovitt’s Natural Gold! Call us now for a free estimate to get your deck looking this good!